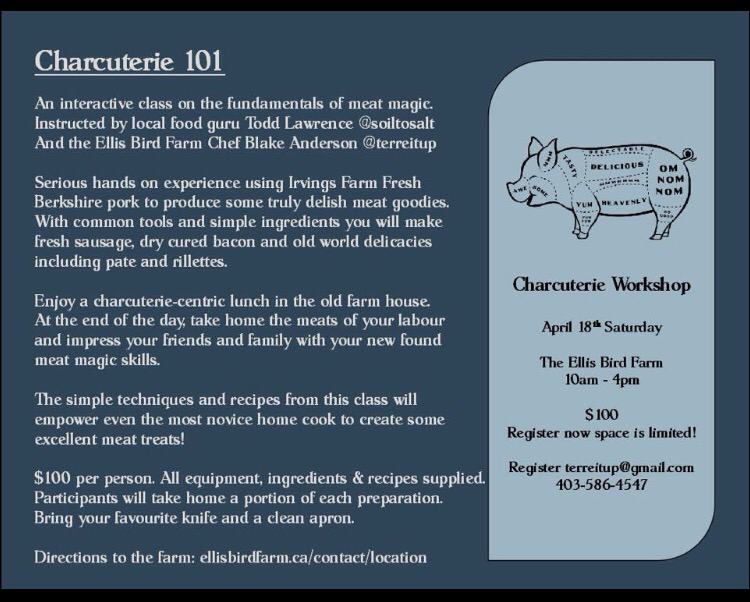 A few weeks ago I took a charcuterie 101 class out in Lacombe at the Ellis Bird Farm. 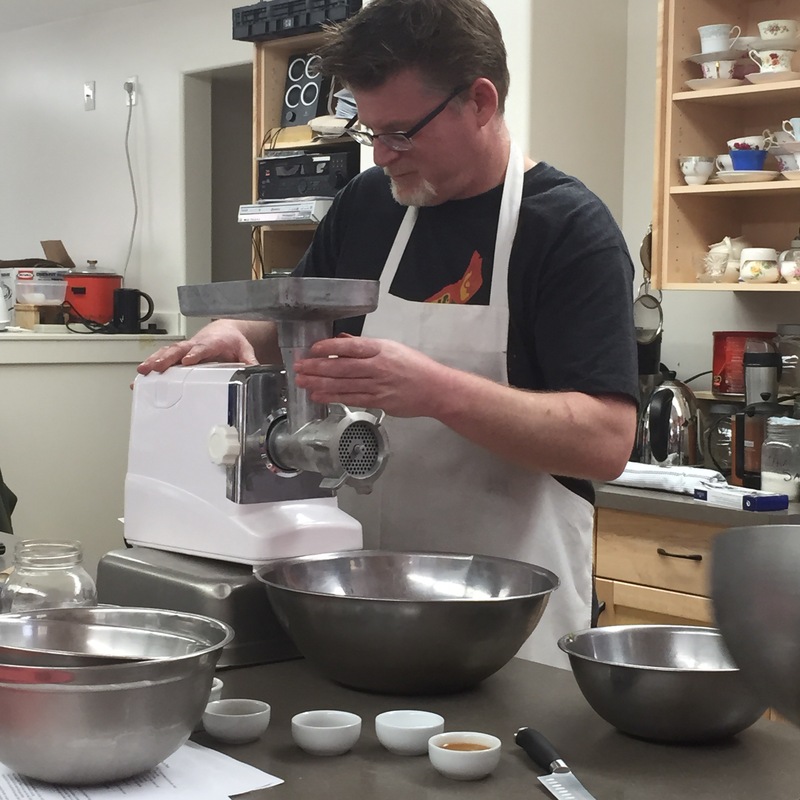 This class was put on by Chef Blake Anderson of Terre It Up catering and Todd Lawrence of Soil To Salt. These 2 gentelmen were amazing, hilarious and passionate about meat! 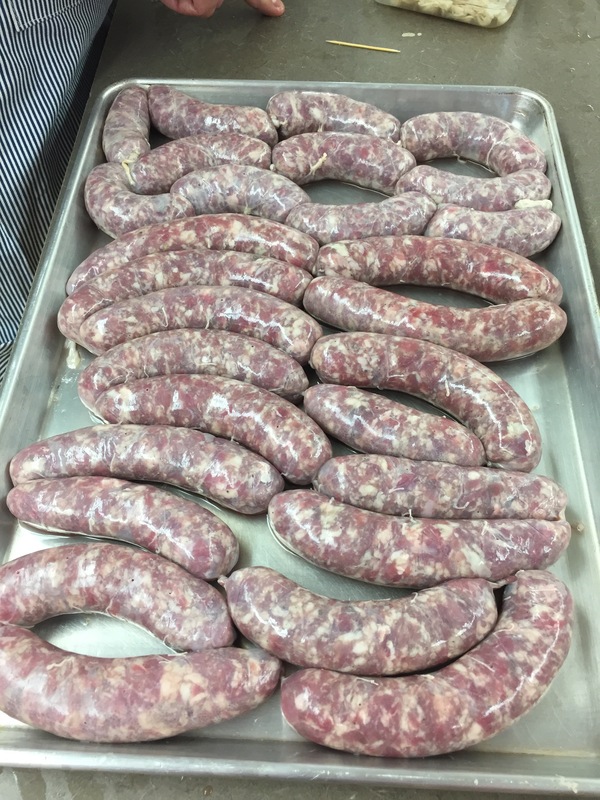 To clear things up, charcuterie is a style of cooking dedicated to prepared meats such as bacon, ham, sausage, terrines, galantines, ballotines, pâtés, and confit, primarily from pork. 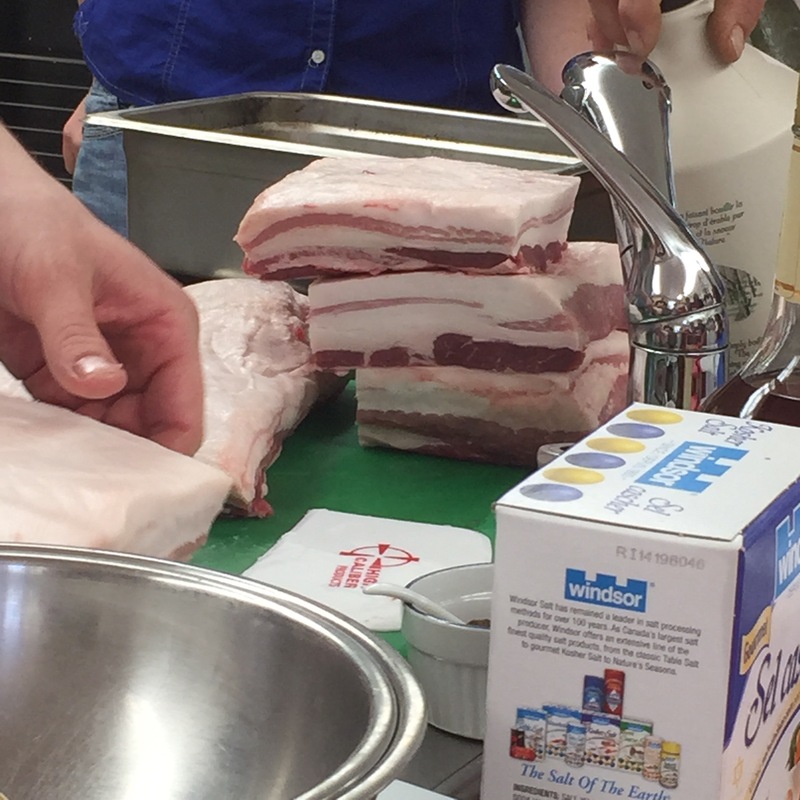 In this intimate class of 12 people we learned the basics of making your own sausage, curing bacon, rendering lard and making pâté and rilette (my personal favourite!). 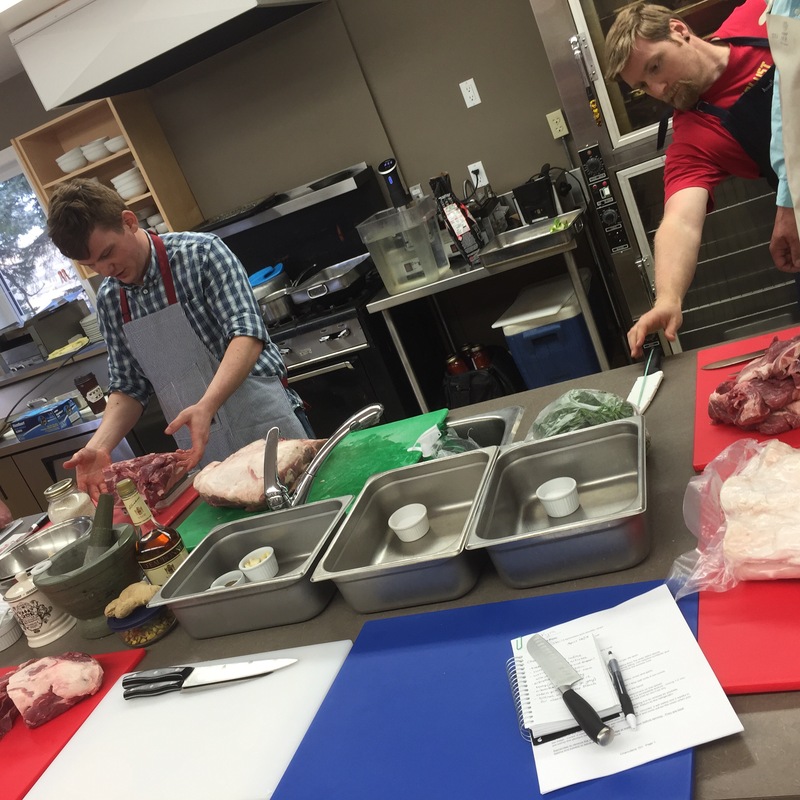 We started the class off prepping all our pork by chopping and cooling. 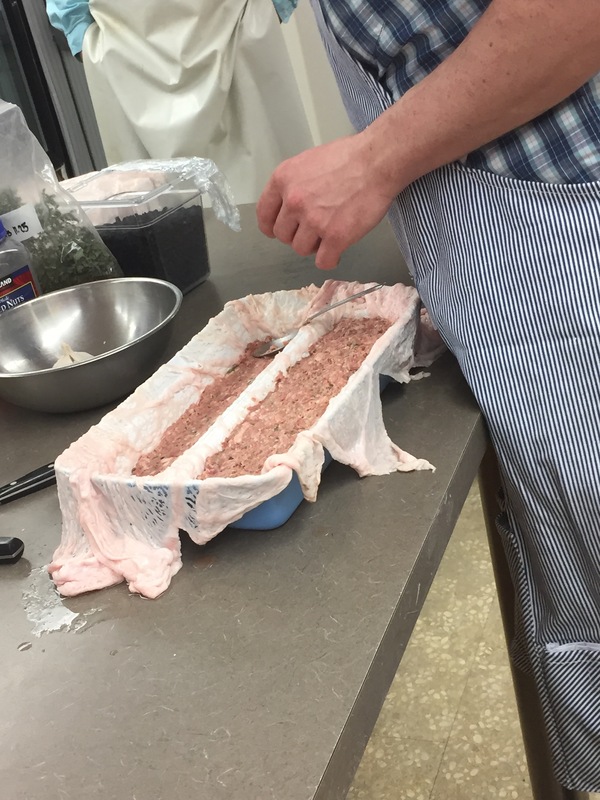 When working with ground pork it’s very important for the meat and all your tools to be very cold so that the fat doesn’t just melt into the meat. Yum look at that fat! 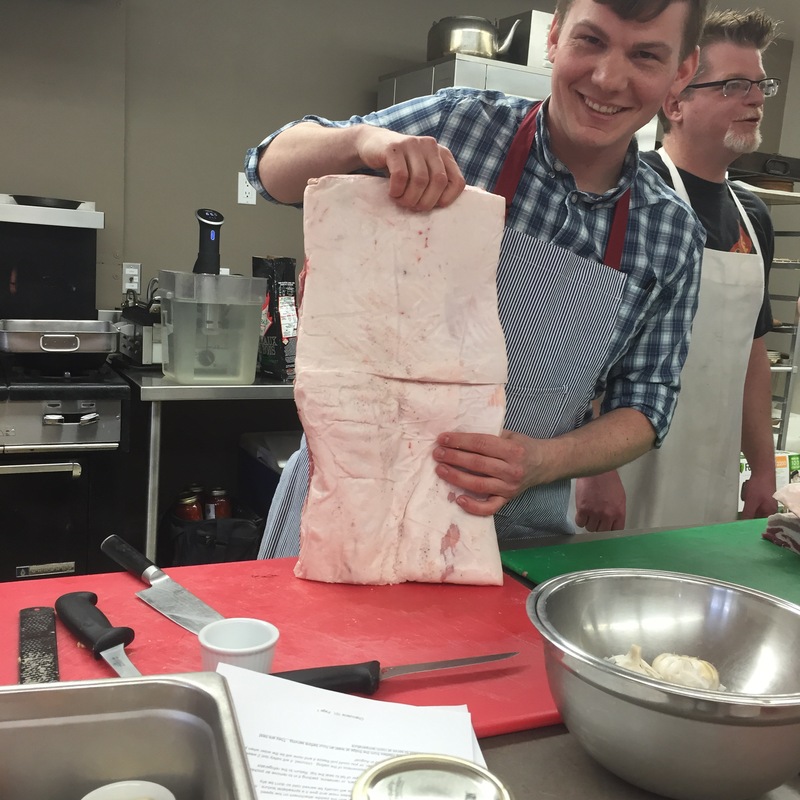 Blake showing off the pork! 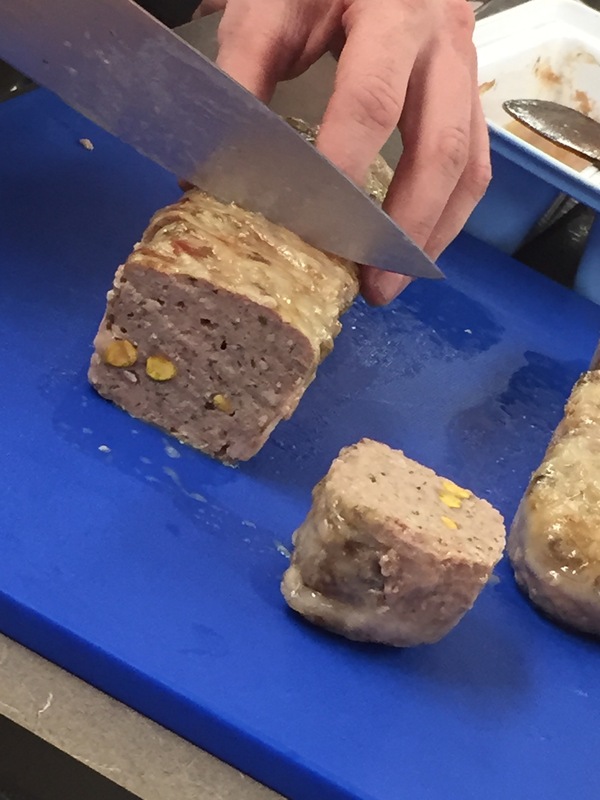 So after all the meat was cut and well chilled we ground and ground and ground some more to make our sausage (3 kinds) and pâté. 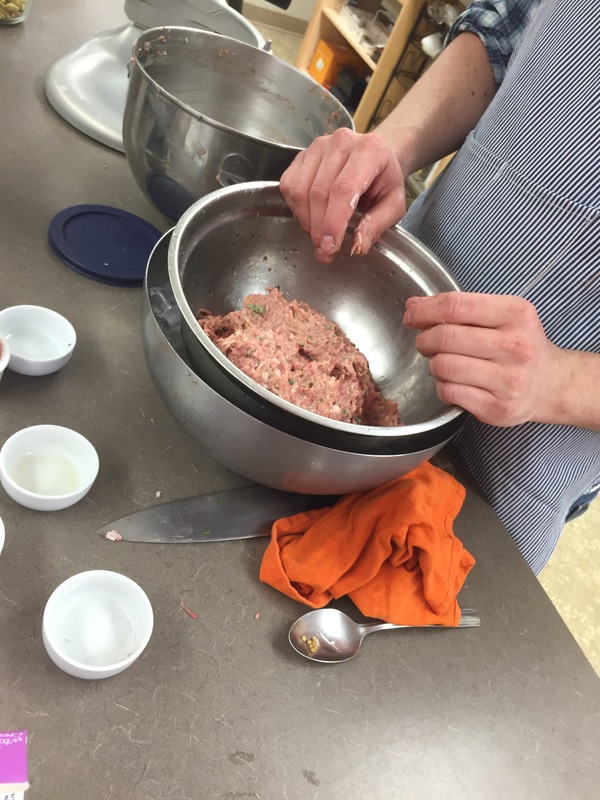 To make the pâté we used a combo of course ground and fine ground pork shoulder and liver, herbs and spices, as well as some liquid. 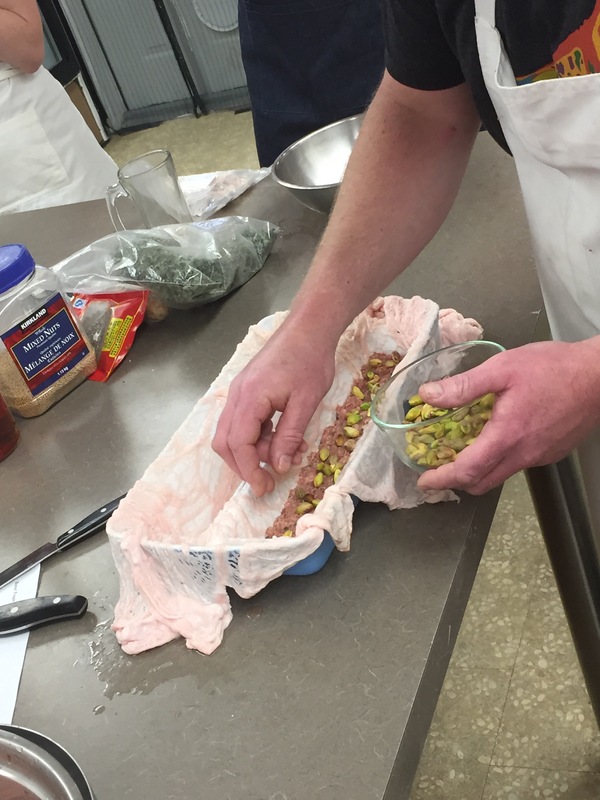 Then a loaf pan was lined with caul fat (could use bacon or plastic instead) and half the meat mixture pressed in then we added whole pistachios then topped with the rest of the meat. 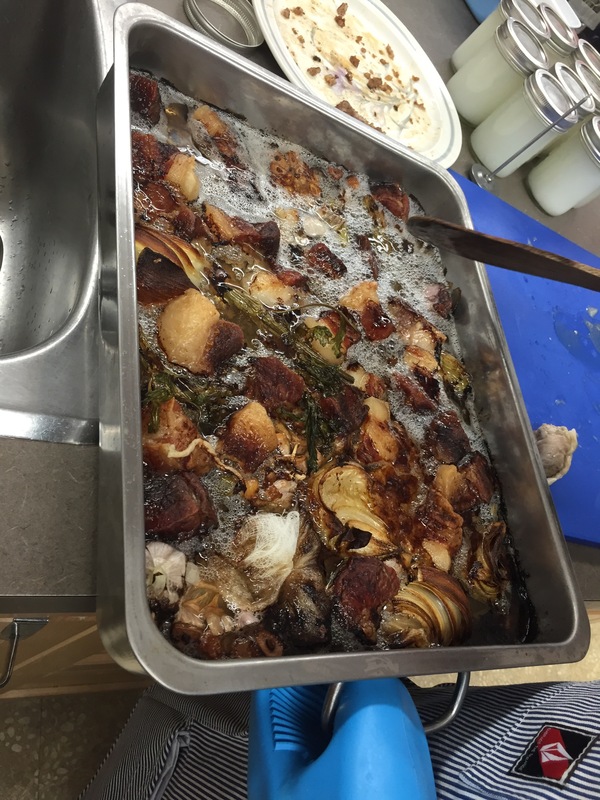 We then placed it in the oven and cooked it ‘Bain Marie’ style (placing the smaller pan into a larger pan with warm water). 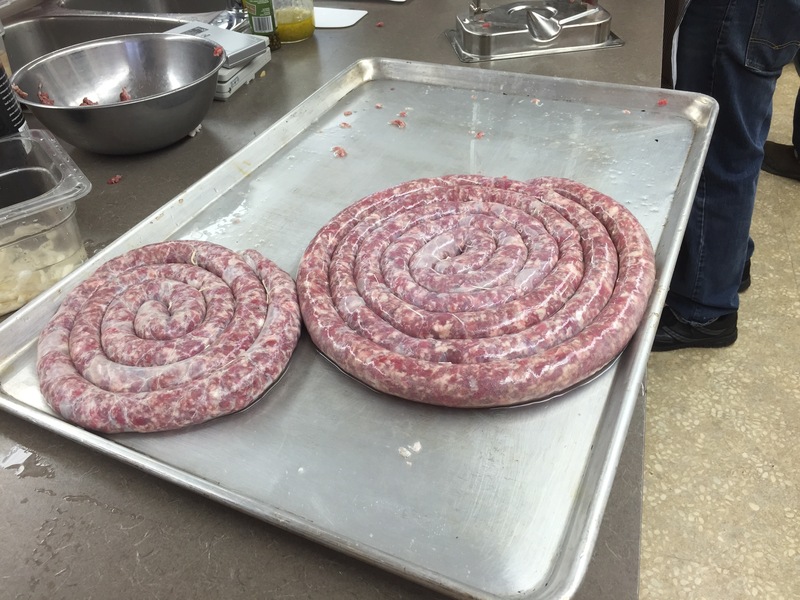 After the sausage meat was ground and seasoned we chilled it some more. Can’t have that meat getting too warm and the fat melting. Then we prepped the casing and started filling. 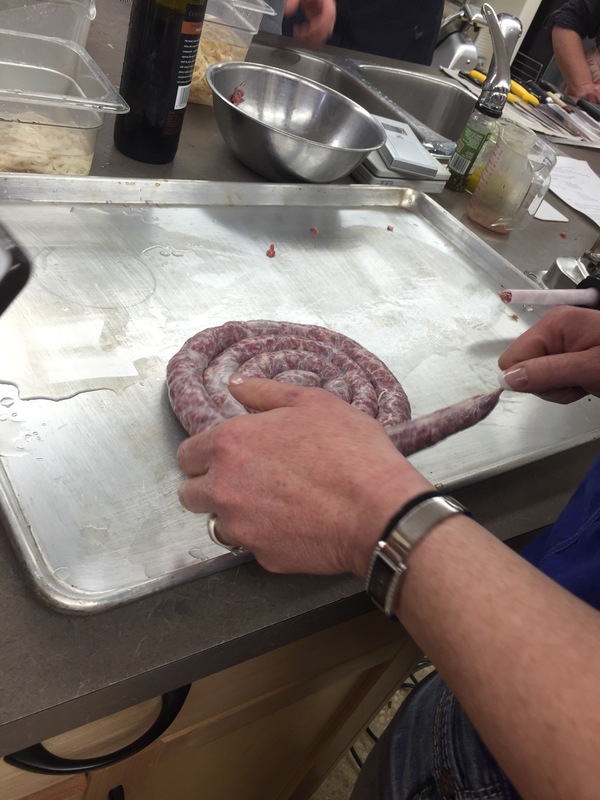 After the sausage was filled we twisted the links. 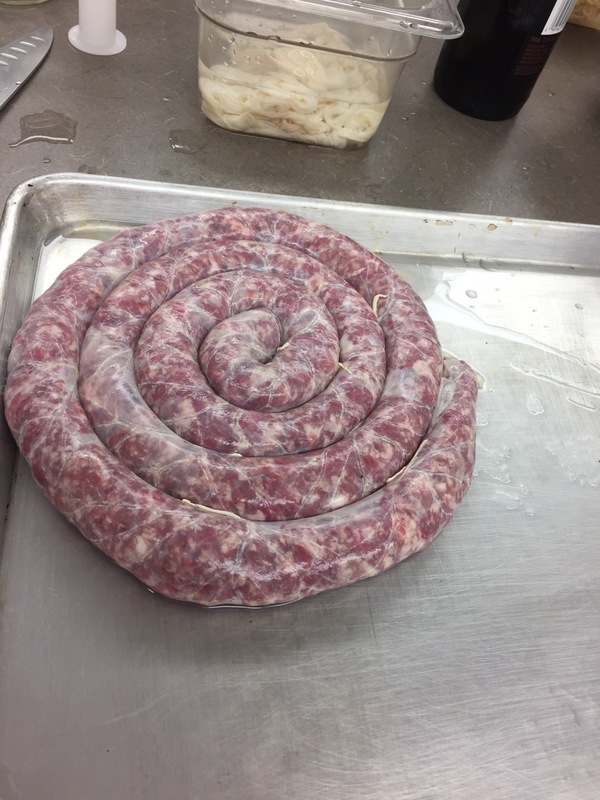 In the beginning of the day we also started the rilette. 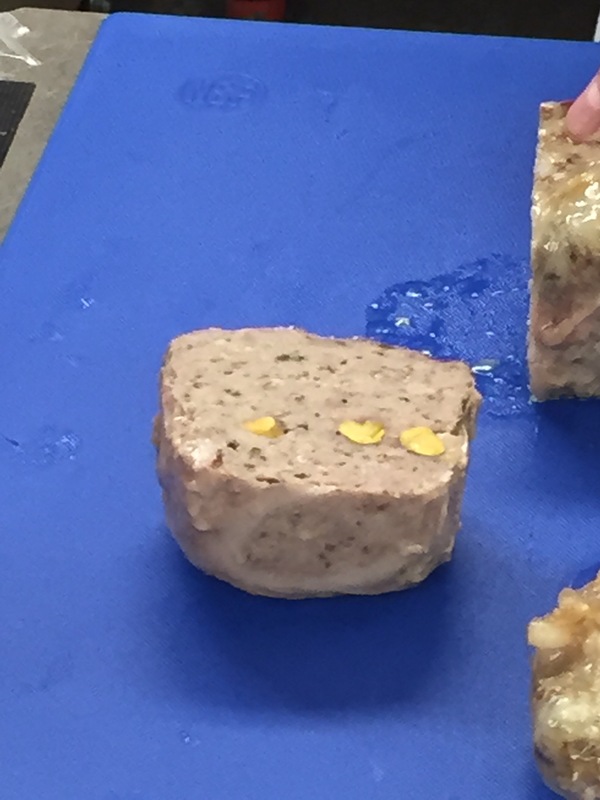 Rilette is similar to pâté, in that it’s made from pork, but with this dish the meat is cubed first then cooked slowly in fat with the aromatics until it is tender enough to shred. 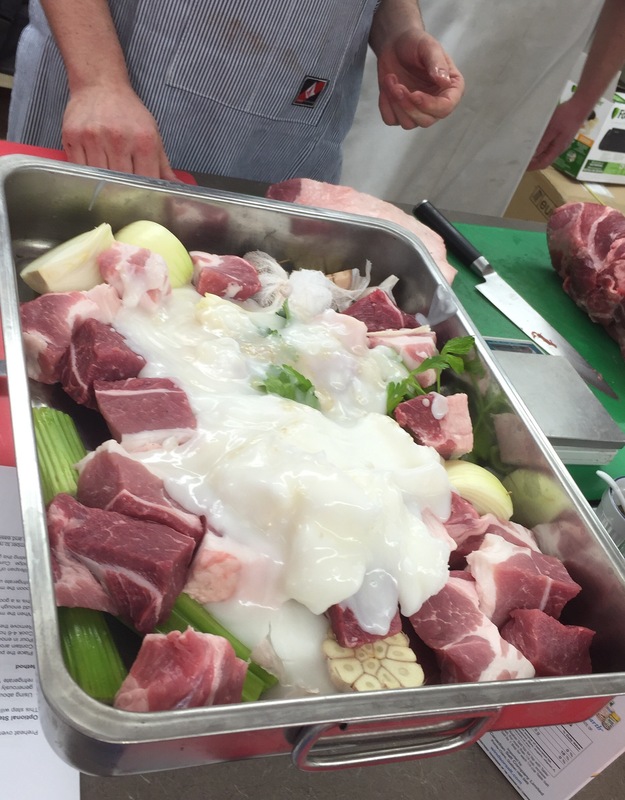 It’s then mixed with some of the cooking fat to form a paste and cooled. This day was so much fun! And I met some amazing people who I hope to see again some time! 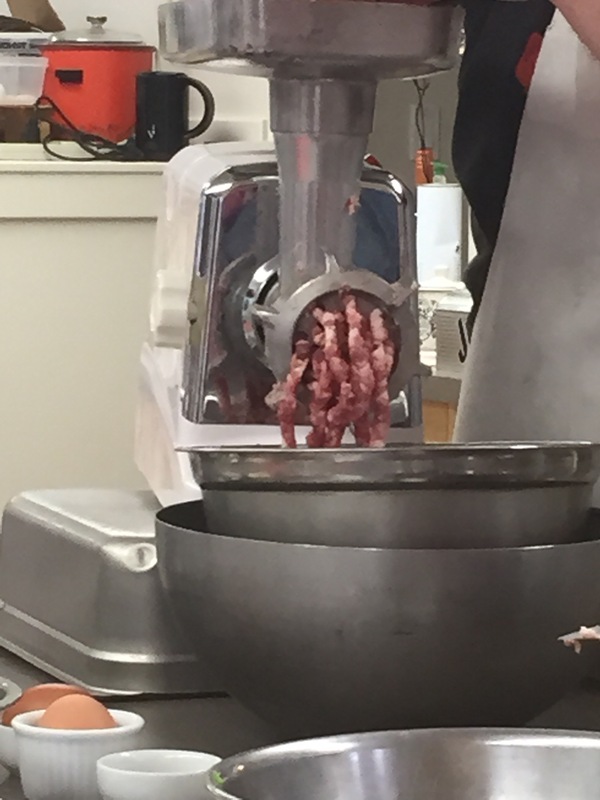 I’m also working on getting my own grinder and sausage stuffer to be able to make my own meaty treats. 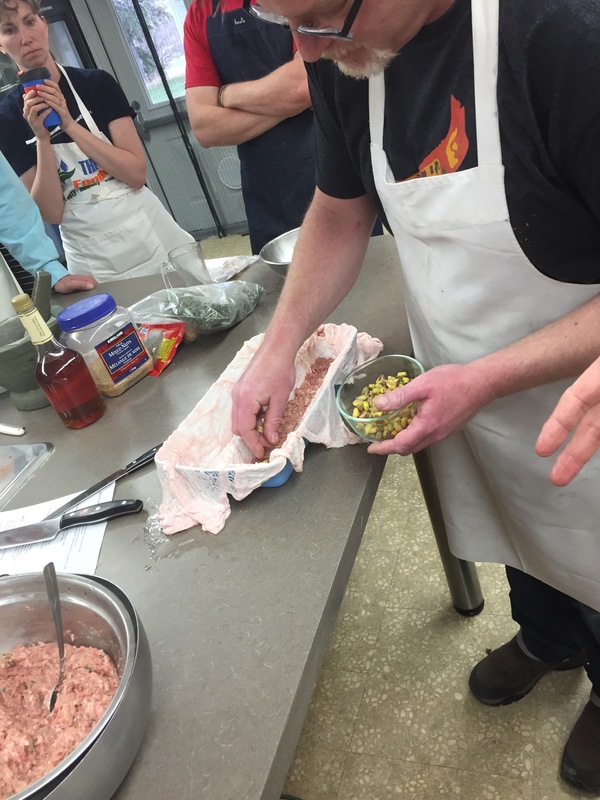 There was talk of a Charcuterie 201 class in which they would teach cured meats such as salami. I hope that’s true cause I’d be there in a heartbeat! 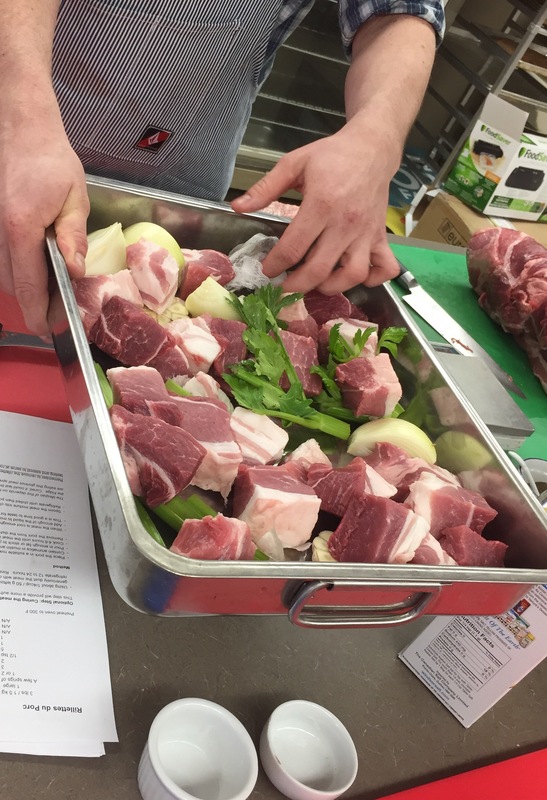 – Put the pork into a large roasting pan and toss in the vegetables and muslin wrapped aromatics. 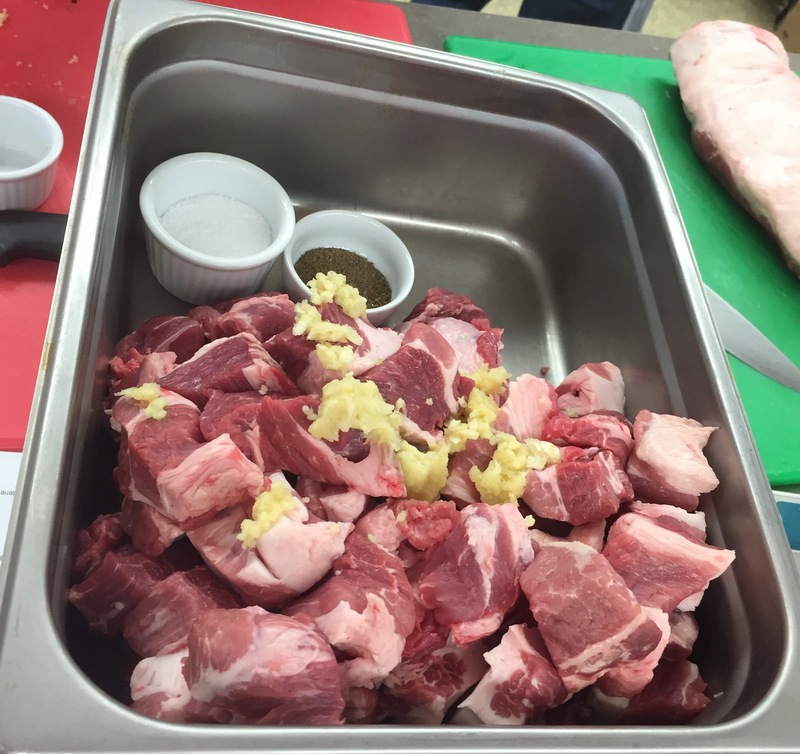 – Top with enough melted fat to coat the pork then sprinkle with salt. 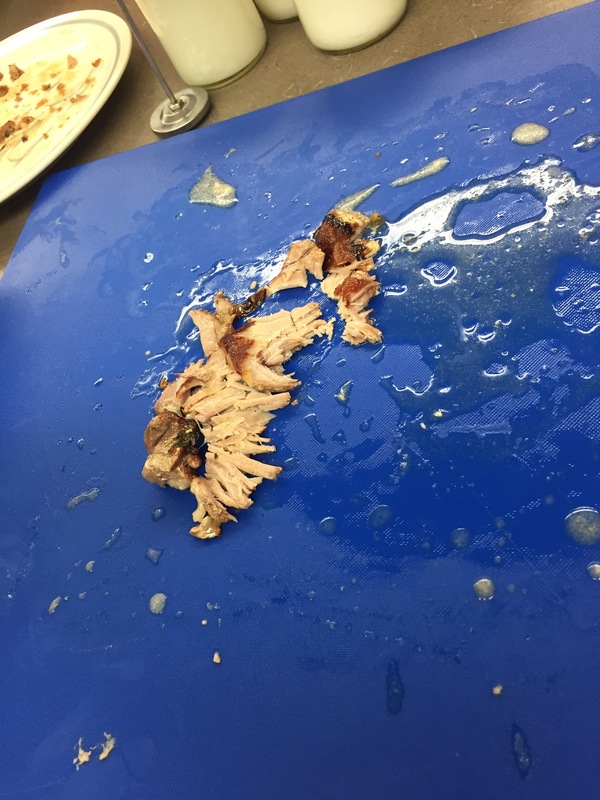 – Cook meat at 300F for 4-6 hours until the meat is tender and falls apart. 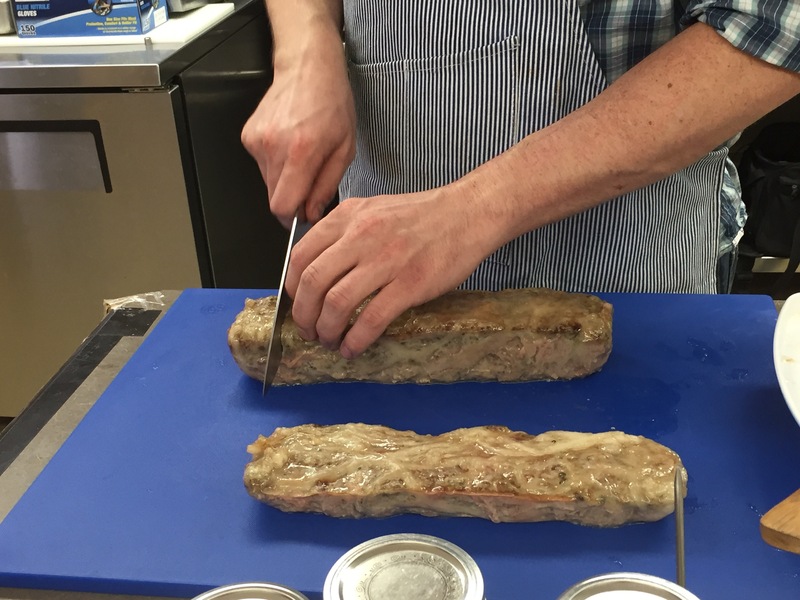 – Once cooked, remove meat from dish and set aside to cool. 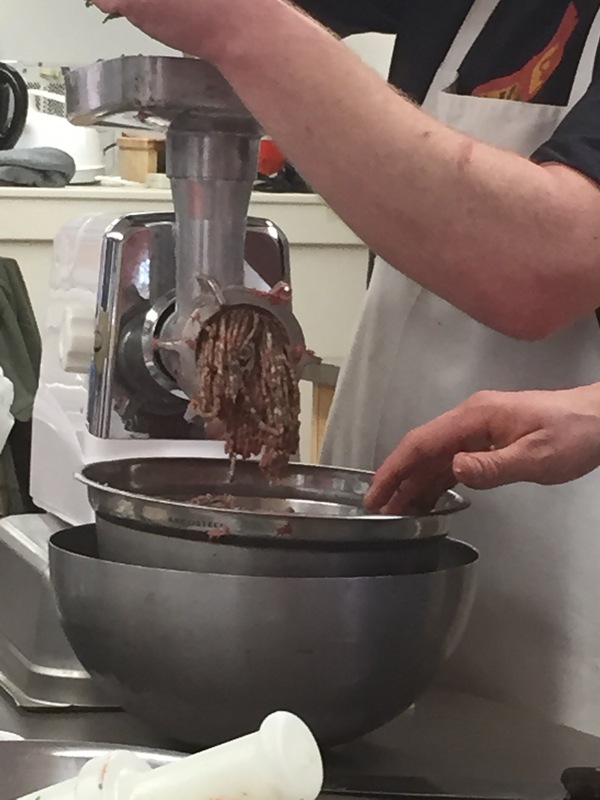 When the meat is cool enough to touch, mix it either by hand or using the paddle attachment of a mixer until it is quite fine. 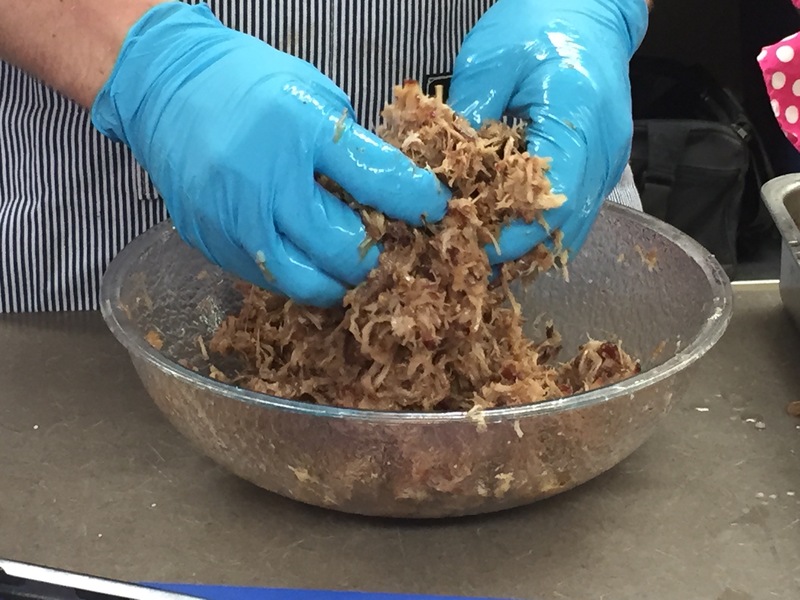 – Add enough of the leftover fat to the shredded meat to create a spreadable mixture and mix for about 2 minutes. 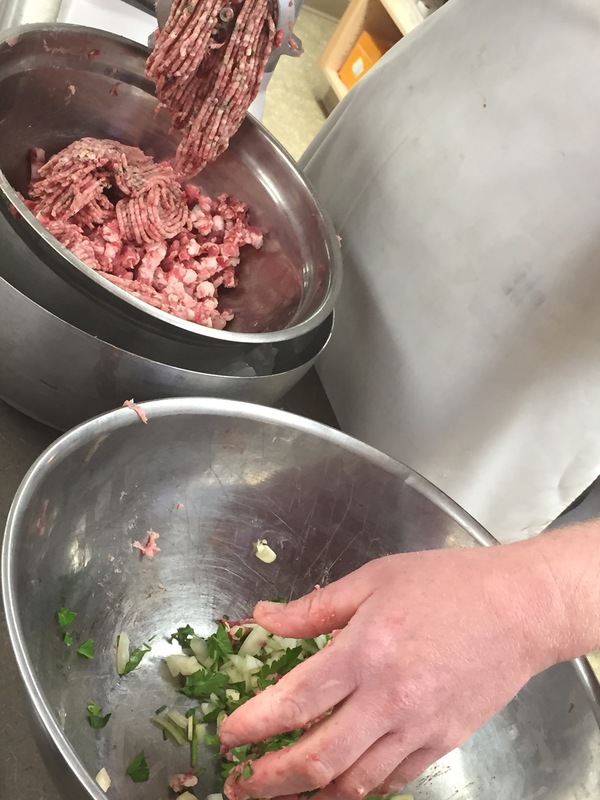 – Taste the mixture and adjust the seasoning. – Pack mixture into small jars ensuring its packed tight with no air pockets. 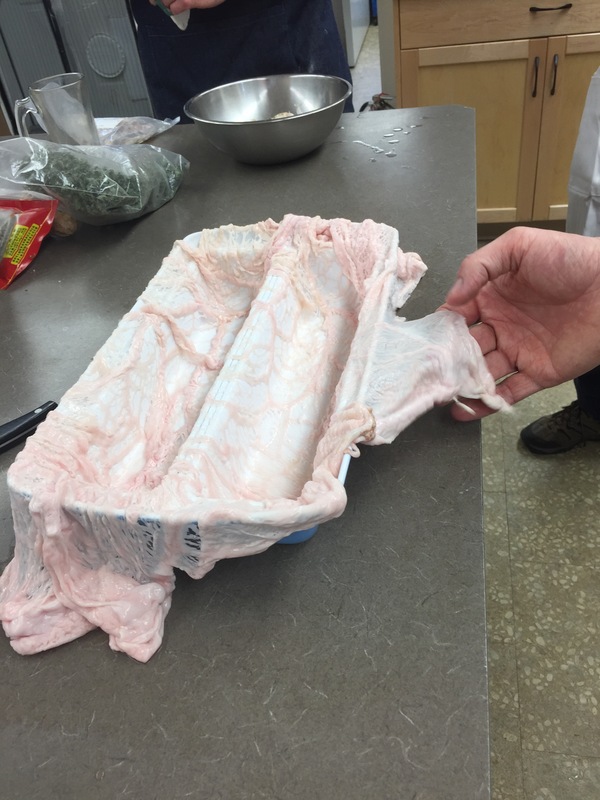 – Cool in fridge then top with a little more fat just to coat the top and seal the meat. – This should last about 2 weeks in the fridge or you can freeze it and it will last months! 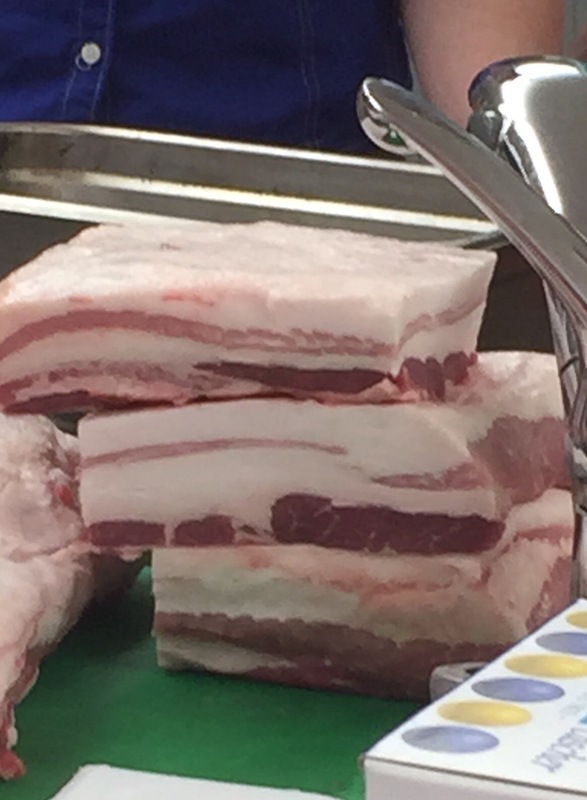 – Allow to come to room temperature before serving (about 1 hour out of fridge).